Four Humboldt County Starbucks are closing Tuesday for racial-sensitivity training. Four Humboldt County Starbucks locations are closing at 2:30 p.m. today (May 29) for racial sensitivity training as part of a nationwide effort by the company following the highly-publicized arrest of two black men at a Philadelphia store after the manager called 911. In an open letter to customers, the company’s Executive Chairman Howard Schultz called the sessions taking place at more than 8,000 stores “a new chapter” in Starbucks history. The stores slated to close this afternoon are: Fifth and E streets and West and Myrtle in Eureka, Central Avenue and Heartwood Drive in McKinleyville and the Fortuna shop on South Fortuna Boulevard, according to the company. The counters at Target and Safeway in Eureka will remain open. This afternoon Starbucks will close more than 8,000 stores and begin a new chapter in our history. In 1983 I took my first trip to Italy. As I walked the streets of Milan, I saw cafés and espresso bars on every street. When I ventured inside I experienced something powerful: a sense of community and human connection. I returned home determined to create a similar experience in America — a new “third place” between home and work — and build a different kind of company. I wanted our stores to be comfortable, safe spaces where everyone had the opportunity to enjoy a coffee, sit, read, write, host a meeting, date, debate, discuss or just relax. 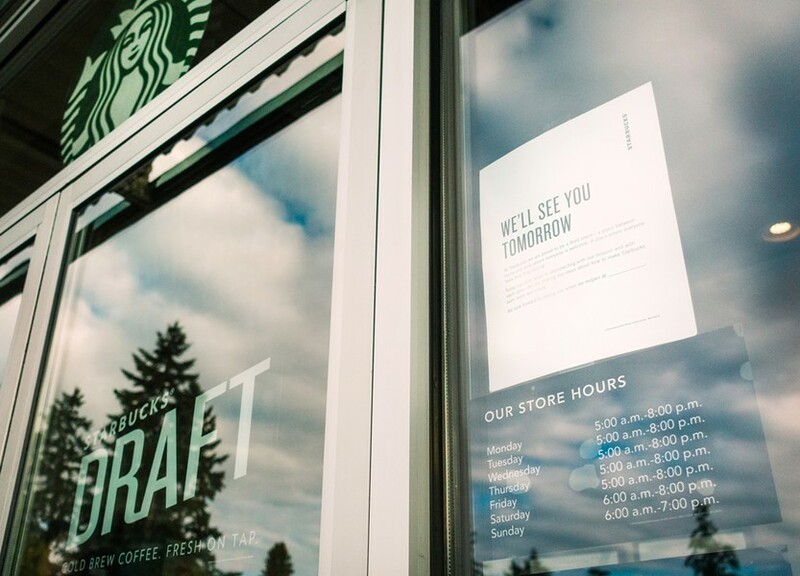 Today 100 million customers enter Starbucks® stores each week. In an ever-changing society, we still aspire to be a place where everyone feels welcome. Sometimes, however, we fall short, disappointing ourselves and all of you. Recently, a Starbucks manager in Philadelphia called the police a few minutes after two black men arrived at a store and sat waiting for a friend. They had not yet purchased anything when the police were called. After police arrived they arrested the two men. The situation was reprehensible and does not represent our company’s mission and enduring values. The incident has prompted us to reflect more deeply on all forms of bias, the role of our stores in communities and our responsibility to ensure that nothing like this happens again at Starbucks. The reflection has led to a long-term commitment to reform systemwide policies, while elevating inclusion and equity in all we do. FOR SEVERAL HOURS THIS AFTERNOON, STARBUCKS WILL CLOSE STORES AND OFFICES TO DISCUSS HOW TO MAKE STARBUCKS A PLACE WHERE ALL PEOPLE FEEL WELCOME. What will we be doing? More than 175,000 Starbucks partners (that’s what we call our employees) will be sharing life experiences, hearing from others, listening to experts, reflecting on the realities of bias in our society and talking about how all of us create public spaces where everyone feels like they belong—because they do. This conversation will continue at our company and become part of how we train all of our partners. Discussing racism and discrimination is not easy, and various people have helped us create a learning experience that we hope will be educational, participatory and make us a better company. We want this to be an open and honest conversation starting with our partners. We will also make the curriculum available to the public. To our Starbucks partners: I want to thank you for your participation today and for the wonderful work you do every day to make Starbucks a third place for millions of customers. To our customers: I want to thank you for your patience and support as we renew our promise to make Starbucks what I envisioned it could be nearly 40 years ago—an inclusive gathering place for all.